Right hand drive conversions look really good, but are not that easy. If you have a spare dash laying around test a right hand drive conversion on it. The best way to create a right hand drive conversion involves some cutting and molding eith bondo. The steps are listed below. 1. Take a dash and it will be need be cut in three pieces see the FIG. 1 below. 2. Take the two end pieces and switch the sides that they were on keeping the middle piece where it is. See FIG 1 part 2. 3. Now that you have the configuration set up use super glue (superglue is the best for it) to attach all the pieces together. glue one side on at a time and try to clamp it together for about 3-5minutes. Glue on the other side and once again clamp it together for 3-5minutes. 4. Your dash should look like FIG. 1 part 3. 5. Fill the spaces and dips with some bondo, and fill part of the sides of the dash Then sand, sand, sand, sand, sand. 6. The rest is left you you fitting it in, it might take some sanding and filling. 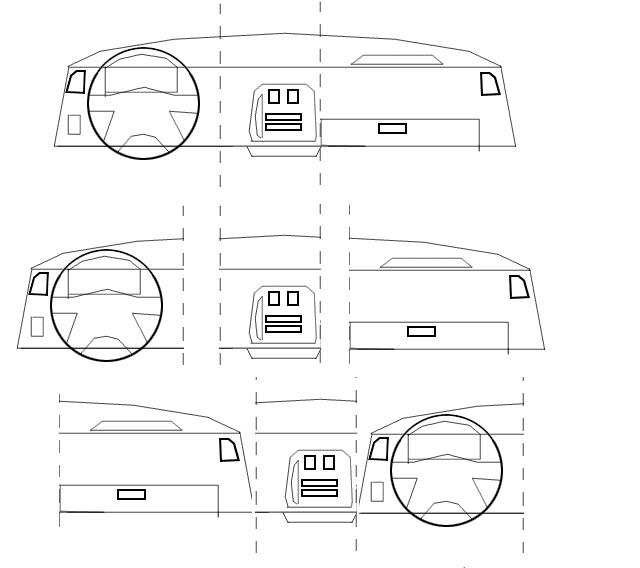 Each seperate dash diagram is a different part.